A: There is a maxim sometimes used in canon law that says, Distinguish the circumstances and the laws will come into agreement (Distingue tempora et concordabis iura). I think it is safe to say that the Roman Ritual has not been abolished and that the bishop has not overstepped his authority. “In recent years the topic of Weekday Celebrations in the Absence of a Priest has been raised by diocesan Directors of Worship and during the 1998 National Meeting of the Federation of Diocesan Liturgical Commissions. The then-Secretariat for the Liturgy conducted consultations with diocesan directors of Worship, pastors and bishops which culminated in an extended discussion by the members and consultants of the Committee on the Liturgy at its March 13, 2000, meeting in Washington D.C. The following reflections are offered to bishops and their advisors and may serve or assist bishops in the formulation of guidelines for this important area of pastoral life. “In recent years, the Church in the United States of America has experienced a reduction in the number of priests available to celebrate Mass on a daily basis in our parish communities. Indeed, in some places, one priest is assigned as pastor of several parishes and is barely able to provide Sunday Mass in each of these communities. In other instances, even the Sunday Mass is not possible each week. Thus, the ritual book Sunday Celebrations in the Absence of Priest was developed. “1. Whenever possible, daily Mass should be celebrated in each parish. “2. 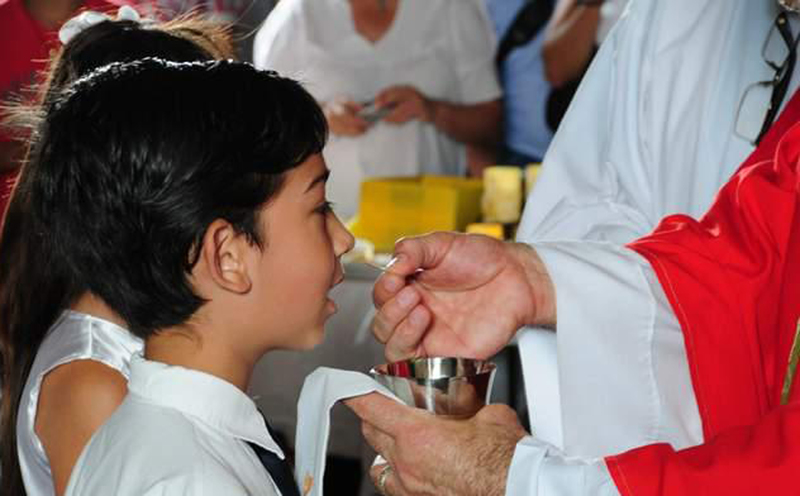 Whenever the Rite for Distributing Holy Communion Outside Mass with a Celebration of the Word is scheduled on a weekday, every effort must be undertaken to avoid any confusion between this celebration and the Mass. Indeed, such celebrations should encourage the faithful to be present at and to participate in the celebration of the Eucharist. “3. Whenever possible, the Mass schedule of nearby parishes should be available to parishioners. If a nearby parish is celebrating Mass on a given weekday, serious consideration should be given to encouraging people to participate in that Mass rather than the parish scheduling a Liturgy of the Word with Distribution of Holy Communion. “4. When daily Mass is scheduled in a parish, it is usually not appropriate to schedule a Liturgy of the Word with Distribution of Holy Communion. This rite is designed for ‘those who are prevented from being present at the community’s celebration.’ When necessary, the scheduling of these celebrations should never detract from ‘the celebration of the Eucharist [as] the center of the entire Christian life.’ Such celebrations should never be seen as an equal choice with participation at Mass. “5. The proper ritual for the Liturgy of the Word with Distribution of Holy Communion is found in Holy Communion and Worship of the Eucharist Outside Mass. The specialized provisions of Sunday Celebrations in the Absence of a Priest are not appropriate to weekday celebrations. Therefore the norm issued by the bishop is in line with Point 4 above. It must be remembered, however, that the reference is to scheduled distribution of Communion in a church where a weekday Mass is celebrated. This is a legitimate pastoral decision that is within the bishop’s authority to determine. That is, do not schedule Communion services if daily Mass is celebrated so as to avoid the possible creation of an equivalence in the minds of the faithful or in virtue of other pastoral considerations. Admittedly, another bishop could come to the opposite conclusion in other pastoral circumstances. In such cases he would not need to do anything, for the universal law as such would not forbid having both Mass and a scheduled Communion service, even though I do not think that the spirit of the documents would encourage such a practice. The bishop’s prohibition would not cover a priest’s normal use of the Roman Ritual to administer Communion to the faithful who, as the ritual says: “for a legitimate reason ask for it even outside Mass,” and who are prevented in some way from attending daily Mass. These spontaneous requests can and should be granted. If such requests are habitual and the impediment to attend Mass is continuous, I think that there is nothing that would prevent the priest from coming to a private agreement with an individual or a group to give them Communion at a fixed time. In such cases we would probably be dealing with well-formed Catholics who would desire nothing more than to be able to attend holy Mass. The bishop would, in all probability, fully agree to attending to their spiritual needs. What he does not desire is that Mass and a Communion service appear together on the same day on the parish notice board or webpage as if they were of equal spiritual value. Following our October 18 comment on communion postures, several readers pointed out a defect in my presentation. Our reader is correct. I seemed to have taken a bad case of deadline-induced laziness. It must be commented, however, that this new version of the norm greatly improves the earlier version, which seemed to imply that kneeling is something of a problem that required pastoral intervention. The new formulation is in line with the thinking of the Holy See and leaves freedom to the individual faithful to kneel, while making no judgment whatsoever as to his or her intentions in choosing to do so. FEATURE: Who Are the Catholics of Sweden?